In this guitar lesson you can ditch your pick as we take a look at some of the basics of playing fingerstyle guitar. Whether you are a rock, country or folk guitar player (or other) …many of types of music use guitar fingerpicking as part of the style. Before you even start playing, I’m going to show you an exercise that’s going to train your right hand to make the correct motions for fingerpicking. 1. Put your right hand thumb on the 6th string. 2. Put your right hand 1st finger on the 3rd string. 3. Put your right hand 2nd finger on the 2nd string. 4. Put your right hand 3rd finger on the 1st string. Keep your fingers curved with a slight arch in your wrist. The whole idea here is that the main power of your fingerpicking motions should come from the big knuckle of your right hand. Your fingers have 3 sections, so I’m talking about the section attached directly to your hand. You need to keep all of the segments of your fingers curved. Now lift up your 1st finger so it’s hovering just above the 3rd string. Without plucking the string, swing your 1st finger back up towards the palm of your hand. 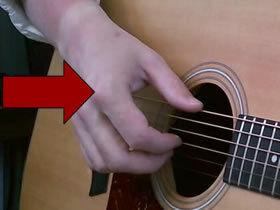 Keep your finger curved and make sure you don’t accidentally sound any of the strings. You are going to be making bigger movements here than you will when you are actually playing, but you are exaggerating the motions at the moment. By keeping all of your other fingers down touching the strings, you are helping to isolate the muscles of one particular finger. Your first finger is swinging like a pendulum from the point of your big knuckle. Do this at least 10 times before moving on to the next finger. Now put your 1st finger back down on the 3rd strings, lift up your 2nd finger and go through the same process. Put your 2nd finger back down on the 2nd string, and do the same exercise with your 3rd finger. Your 4th finger is just going to tag along with your 3rd finger here. You don’t really use your right hand 4th finger in fingerstyle playing, with the exception of some Flamenco strumming techniques. Do the same exercise for your thumb as well. Your thumb has 3 joints of motion, and the one you are going to be using is up near your wrist. Always keep your fingers to the right side of your thumb. The 1st fingerpicking guitar pattern we are going to look at is in 4/4 time. Try this first with the open strings, and then you can plug it into some different chord progressions. 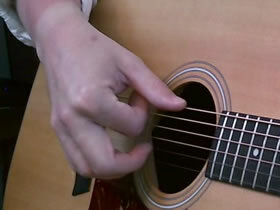 Hover your right hand fingers just over the strings you are going to be playing (1st, 2nd, 3rd and 6th). Then play the 6th string with your thumb, 3rd string with your 1st finger, 2nd string with your 2nd finger, and 1st string with your 3rd finger. You are playing 8th notes here, so you will need to play the T123 pattern 2 times in a row to get one measure of 4/4 time. The numbers you see below are the right hand fingers to use, and not the frets like you would see normally in tablature. The “T” stands for “Thumb”. Now let’s plug that fingerpicking guitar pattern into a chord progression. In this case, just going from a G to a C chord. Notice how on the C chord your right hand thumb is playing the 5th string instead of the 6th. For basic fingerpicking guitar patterns, your thumb will play the lowest note you would normally strum if you were using a pick. Even thought you are not playing all of the strings you would normally strum in these 2 chords, still place all of your fingers on the chord. For instance, even though you are not playing the 4th string in a C chord for this fingerpicking pattern, I want you to still place your left hand 2nd finger on the 4th string at the 2nd fret. You are doing this for a couple of reasons. One is that if you accidentally play the 4th string, the note will be part of the chord and sound good. The other is that C is already a familiar chord shape, so it’s easier just to place your fingers down in a way they are already used to. The next basic fingerpicking guitar pattern is in 3/4 time. And now try playing this 3/4 fingerpicking guitar pattern going between a G and C chord. What we have covered in this basic fingerpicking guitar lesson is really just the tip of the iceberg. There are a lot of different fingerstyle patterns and techniques to explore. 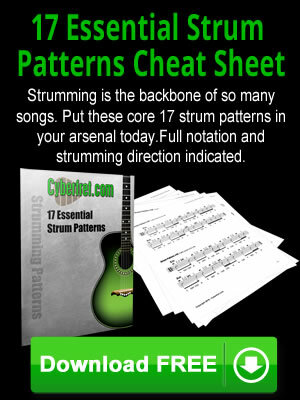 The next thing you might try is to plug these basic fingerpicking guitar patterns into some other chord progressions. Then start to seek out some songs where you might be able to put your new found fingerstyle guitar skills to work. Be sure and also check out my video guitar lesson covering Travis Picking. 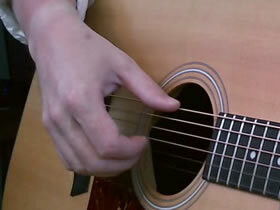 This is another very common style of fingerpicking. Q: What about resting your right hand pinky on the guitar for better support? A: I don’t really rest my right hand pinky on the guitar, because I find that it hinders the movement of my 3rd finger in this style of fingerpicking. There is another style of fingerpicking called “travis picking” that doesn’t use your 3rd finger as much, and so there are some guitar players who play in that style that often brace their right hand pinky.